... on the Market that was. I've just finished unpacking everything after Friday's market, and to my horror found a wet tablecloth that I'd totally forgotten about! I was immediately transported back to that very exciting ten minutes late in the evening when the heavens opened and the wind rushed through King George Square, causing absolute mayhem and an early exit! Other than the rain event (mostly deflected by an emergency plastic dropsheet I had in my kit... mostly!) it was a grand evening, filled with sparkling lights, cheery talks with other people-who-like-to-make-things, and some chance encounters with old friends. I shared a table with Sharon from Treble Two, who had a wonderful collection of crochet goodies, appliqued needlebooks and cards, and became an excellent co-conspirator during the Great Flapping Plastic Dropsheet Adventure. I learned a few things from this market. One is that I am hopeless, HOPELESS! with names. I called Sharon 'Laura' almost as soon as we'd met, and soon after that I directed a fellow stall-holder to 'Belinda'... "that girl down at the end with the glasses on her head."... and then knew it was Rebecca, not Belinda, who I'd meant. Gah! The third thing I learned is 'Don't underestimate the power of your Mum coming along and putting on the charm and asking curious questions about your things in order to provoke another customer into buying something'. I never believed that kind of thing worked (having witnessed it in various big cities when some shady dudes are trying to sell something out of a suitcase and they get their friends to crowd around as though they're buying) but last night... proof! and my Ma did buy something too. Thanks Ma! Definitely a big YES to the 'be making something at your table' idea. 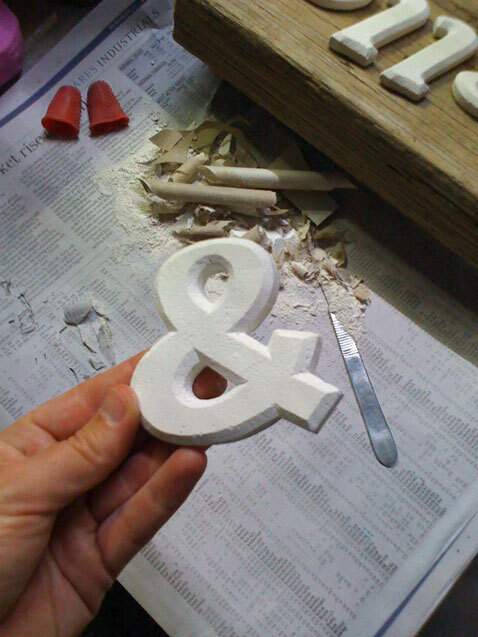 For much of the night I carved an ampersand from a piece of plasterboard, and people did stop to watch. I found it really relieved the tension I've felt at previous markets, the I'm standing here waiting for people to look at my things thing. It's stressful, man! It provokes an intense desire for alcohol! Does anyone else feel like that, or is it just me? Well, on Friday night I was able to just look up and smile every so often, answer questions anyone had, and be demonstrating where the originals of those plaster letters come from. No, I didn't just buy the moulds, thanks for asking! So, what next? Each market I do gets easier, and more enjoyable. I'm really looking forward to May, when City Hall will re-open after the renovation, and be the venue for a new BrisStyle Indie Market. It'll be on Saturday mornings about once per month, and be inside! No tents! No lighting! NO RAIN! I think they could be fun, and hope to be involved. It's a good incentive to get some new products underway, as I'd really like to (gasp!) have a whole table to myself! I've put it off long enough... there's a festering tablecloth I must deal with. It may never be the same again - wish me luck! ... on Market preparation, and a new sign! 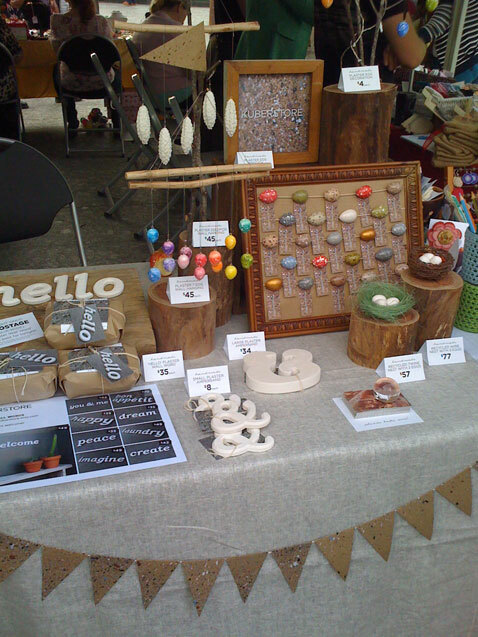 Tomorrow night it's the first BrisStyle market for the year and, weather permitting, I'll be there! I'm sharing a table in the co-op section, and would love for you to drop by and say hello if you're passing through King George Square in Brisbane - I'll be there from about 4.00pm. 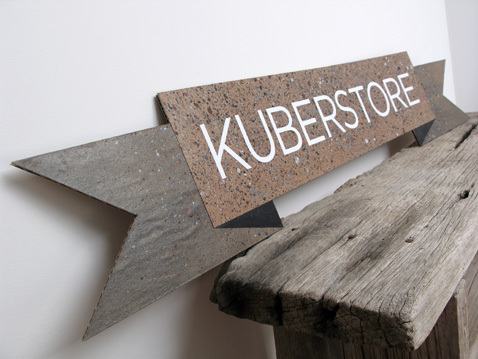 I've been busy making myself a new Kuberstore sign, which I hope to be able to suspend from the marquee somehow. 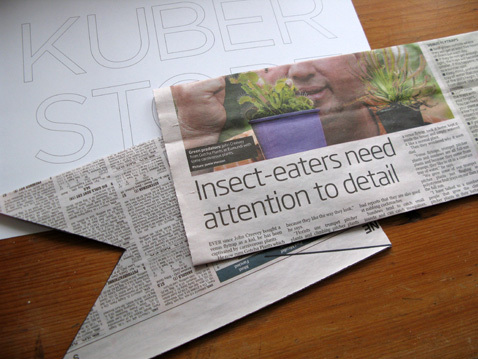 I had in mind some kind of speckly-flaggy-banner-cardboard-cutout-letters-type creation, so I cut out a newspaper mockup to see if it might work. Yes, I think so! 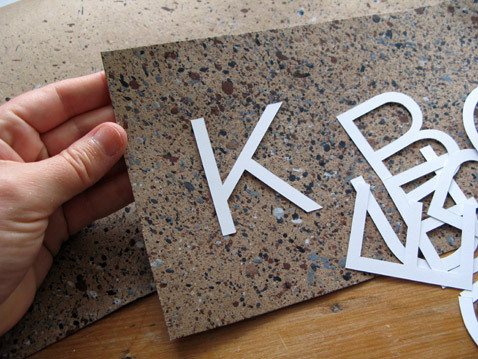 I then speckled up a nice big piece of brown card, cut out my logo from white card, and painted in some shading. I've just finished glueing and varnishing it this morning... here it is! I've mounted it on a piece of corrugated cardboard, so it's very light and hopefully won't be too tricky to install. We'll see! This time I've resolved to make things a bit more vertical in the display department, so have recycled my old sign into a brooch-stand. That should clear up enough space for me to be able to sit at the table and carve some plaster, which both gives me something to do, and demonstrates what it is exactly that I do. I have wondered whether people looking at my things realise that I make them from scratch. This will only be my third market, but one thing I have noticed is that people are more likely to approach a stall and have a good look if the owner is either already busy with a customer, or they are sitting there concentrating on making something. Plus, just standing there behind my table watching people looking at my things (or worse, not looking!) makes me feel very awkward and exposed, and is something I have struggled with so far. Perhaps this is the answer! 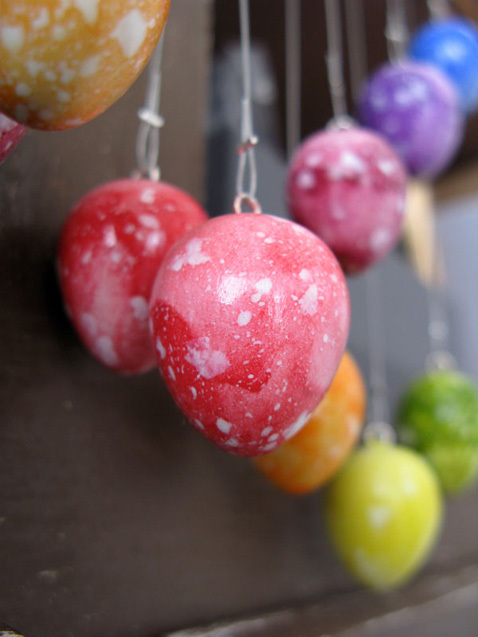 So, my rainbow watercolour plaster bird's eggs will be making their first appearance - can you believe it's only five weeks until Easter? 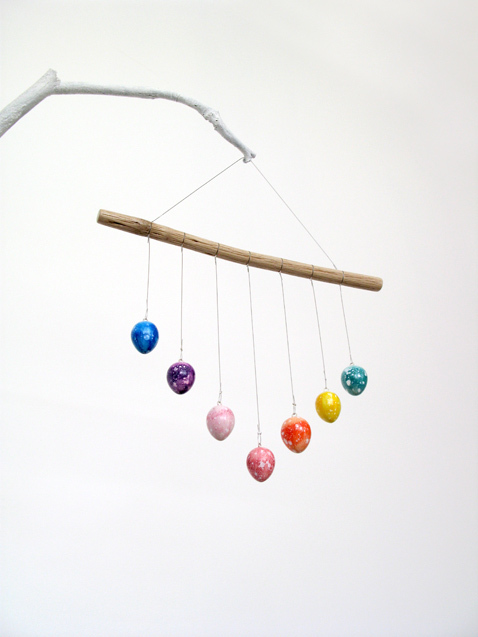 Something from this cheerful little collection would make a lovely Easter gift for someone who doesn't eat chocolate, and I'll have several wall hangings available, as well as individual hanging eggs. Weather, please be kind to us - and do drop by if you're in town. I'd love to see you! 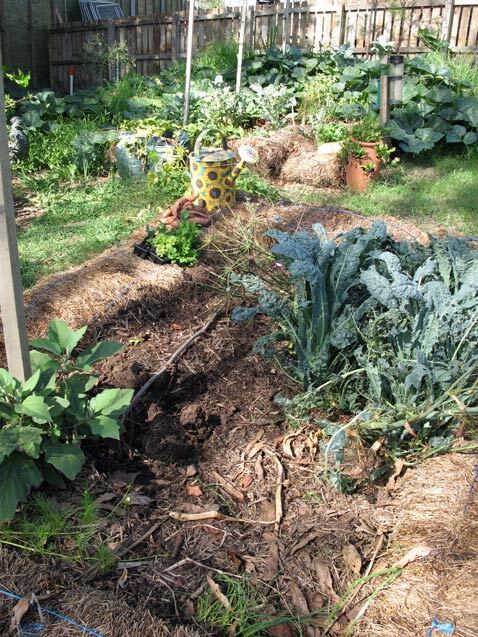 I took the camera out into the vegetable garden this morning so I could share with you the disgrace that has befallen my two Stephanie Alexander no-dig vegetable garden beds. You may remember how luscious they were looking towards the end of last year. Since then it's been hot, it's been wet, it's been windy, it's been dry, it's been humid, it's been harsh, and as a result most things have turned up their toes. I'm hesitant to replace them because of the hordes of insects that are munching on anything that dared to survive. But you know what? I went out to capture the shame, but in fact I found some good stuff going on! The first bed is sprawling with pumpkin plants, who have happily spread beyond the garden and colonised the entire back corner of the yard. 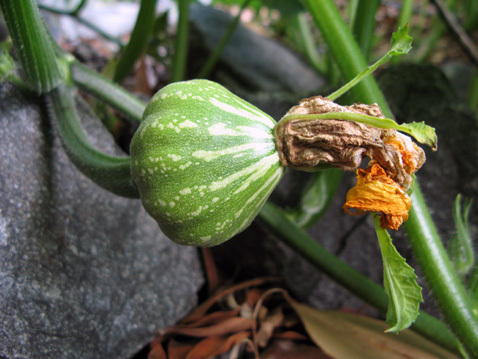 Although all the tiny pumpkins have rotted off due to rain and humidity (I think), I have hopes that soon the weather will be in their favour and it'll be pumpkin-a-go-go around here. Other than the pumpkins there's some caterpillar-fodder purple-sprouting-broccoli, some pestilential remnant silverbeet and one tiny patch of self-seeded rocket. True to its name it's bolting to seed almost before we can eat any of it but if I'm quick enough I can grab a leaf or two for a salad. 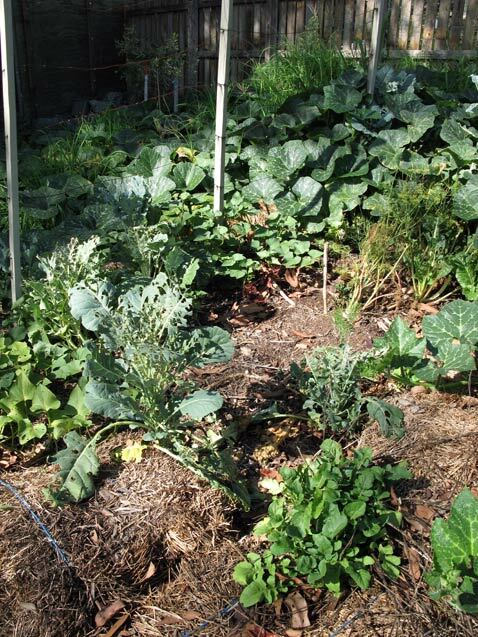 In the second bed the kale is slowly making a come-back after some months of being ravaged by a horrible spider-webby caterpillar - I think it's a two-year type plant so I hope it will continue to crop over the coming cooler months once the bloody bugs die off! 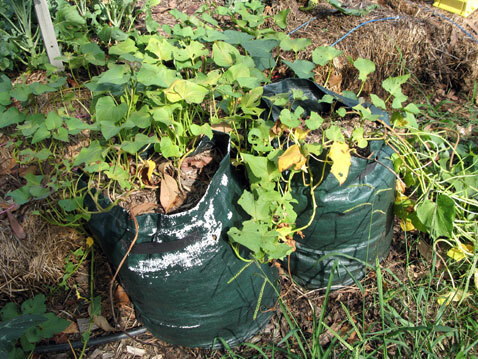 There's also one valiant eggplant continuing to struggle against daily assaults by the local birds (chooks included) who have proven they will dig DEEP to get a taste of the Hydrocell water-saving stuff that is in that bed. Apparently it's non-toxic... I hope so, because there's some maggies and crows around here with a serious addiction! 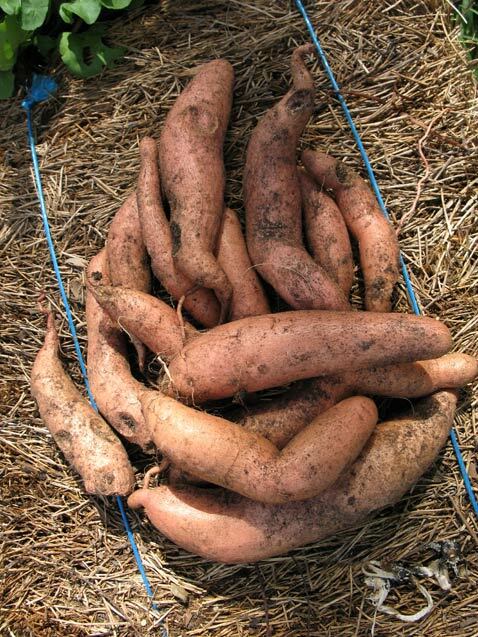 I checked out the sweet potatoes which have been growing in bags since last year. One bagful looked a bit wilty (and the bag ripped when I attempted to move it - looks like those spud bags will only last for two crops) so I tipped it out to see what was going on. 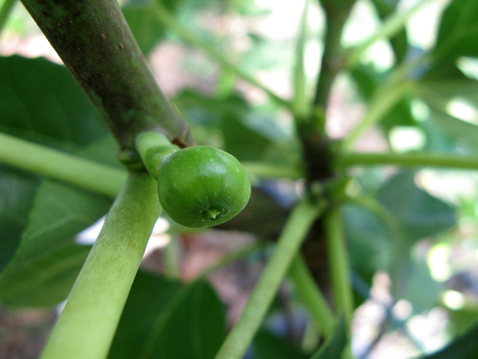 The little fig tree is another thing that has seemed to flourish after the hot/wet/humid rollercoaster Brisbane has been on for the past month or so. It's sprouted so many new branches I've had to stake it to stop it falling over, and is covered in tiny little figlets. 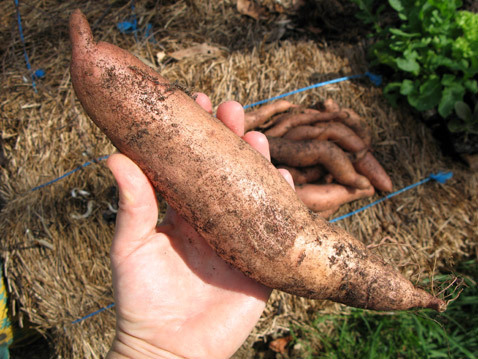 I'm feeling positive about the garden, as the nastiest (and most unrelenting) part of summer should be behind us now. I'm looking forward to re-planting it all out with cooler-weather things once February is over and who knows? I may have an awesome pumpkin crop to report upon soon! Ideas are funny, aren't they? You'll be minding your own business, maybe digging in the garden or peeling potatoes, not thinking about anything very much, when... WHAMMO! A thought will suddenly arrive, unbidden! into your head, leaving you thinking "Where did THAT come from?" and then, as experienced by me a week ago; "... and why haven't I thought of that BEFORE!?" The thought was this. 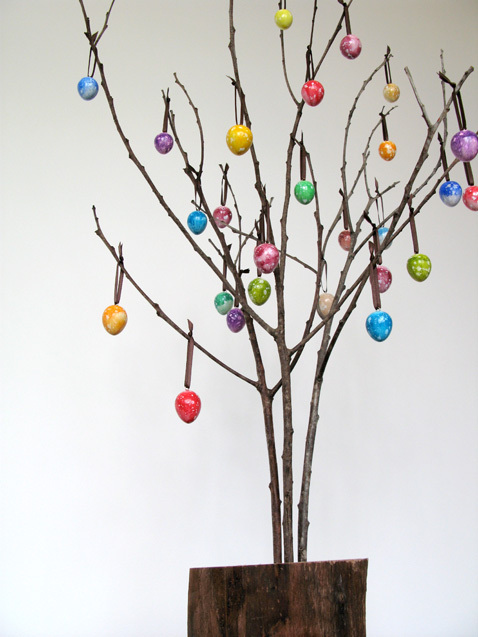 I'd finished drilling holes and glueing metal loops into the tops of a batch of my smaller plaster eggs. They were ready to be painted, and I was planning on undercoating and then layering up the acrylic colour coats on them in an array of rainbow hues. But I swear, I wasn't even thinking about them one morning last week when suddenly I thought watercolour. WHAMMO! 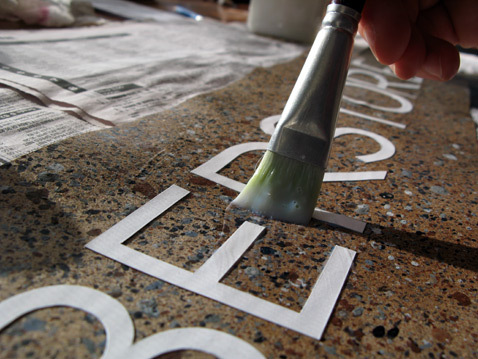 I thought of my previous experiments of colouring my plaster letters by soaking them in ink, and wondered why on earth I've never thought of colouring the eggs in a similar way. 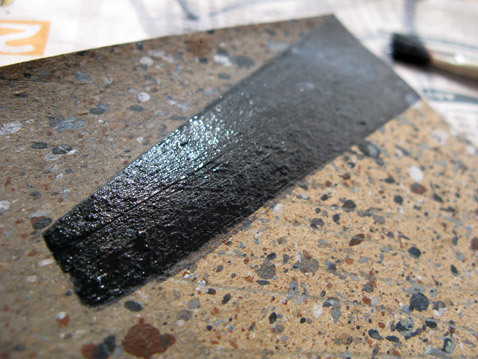 I knew, from the letter colouring trials, that the plaster has various densities that absorb the pigments to different degrees - an effect I wasn't pleased with at the time. WHAMMO! 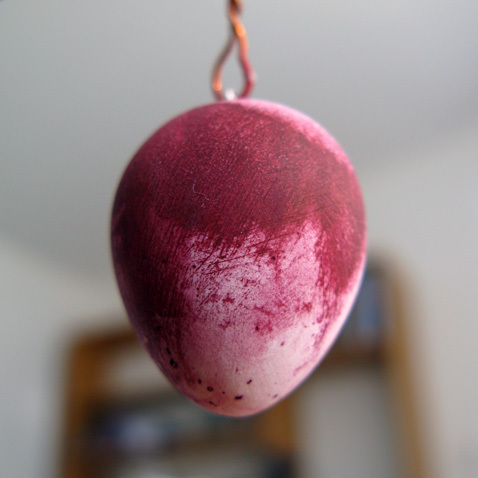 I had a vision of a plaster egg soaked in watercolour paint, and it was all mottled and lovely, picking up the textures of the plaster; dark in places and light in others, any textural differences in the plaster highlighted... I had to try it straight away. I couldn't believe my eyes! They turned out exactly as I'd imagined. 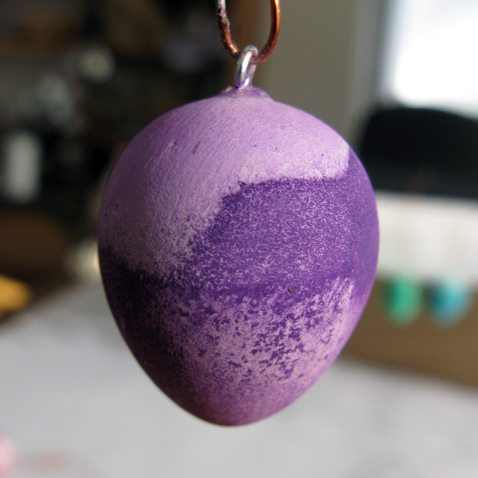 I could see that less colour was absorbed where I'd sanded the eggs. At the bottoms, where the plaster is denser (I think the smaller particles naturally sink to the bottom when I bang the moulds to get the bubbles out) hardly any colour went on at all. Inbetween, the colour was really rich, and any surface textures were picked out with denser pigmentation. The result was, for want of a better description, really watercolour-y, and I was so surprised! 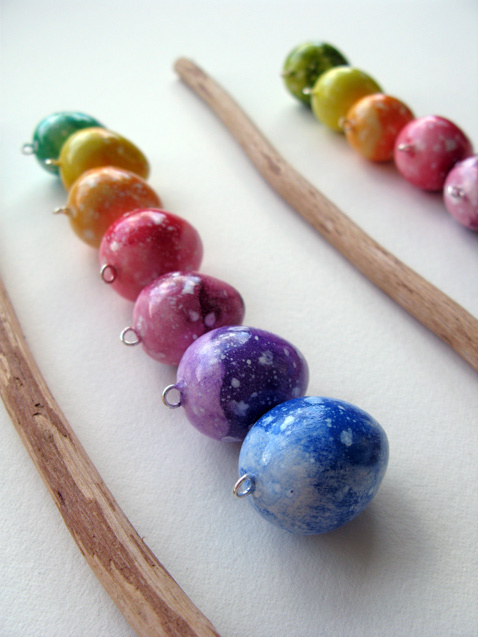 I speckled them all up with white paint, sealed them with several coats of varnish, and sat back to look at them. 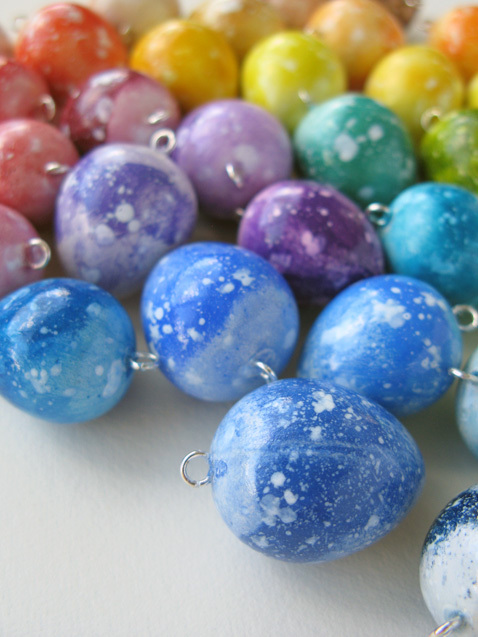 They look like galaxies! There's rainbow craziness all over the table, and I'm feeling pretty happy about it. I've set out a couple of rainbow-song wall hangings (you know... "Red and yellow and pink and green!") which I'll have ready for the next BrisStyle Twilight Market in King George Square. First market for the year - less than three weeks to go now! I know I said I was planning on retiring these eggs. I was wrong. They've evolved!